"I thought if I held off until I was thirty, it meant I really wanted a tattoo. It meant that I’ve been thinking about getting a tattoo since I was fifteen and waited nearly fifteen years to finally have one done. I’m a guy who wants things, and sometimes my wants are fleeting, like a child with a new toy; after an hour of play, I’m bored. But after that one tattoo—an enormous dragon on my right calf—I’ve been getting a tattoo done every year, and I love every one of them. My tattoos are a way to call attention to my body on my own terms. For most of my life, I was fat. When I got my first tattoo, I was close to four-hundred pounds, and I wanted people to look at me because of my tattoo, not because I was enormous. I think long and hard about my tattoos. I have a total of five, and I’m thinking about getting another one done soon. All my tattoos have stories, and because they have stories, I wanted a tattoo artist who I not only trusted, but was a close friend, a person who would do what I wanted, and share in my life. My artist is the poet Ruth Awad, and I can say with certainty, she is the best. I don’t give Ruth easy tattoos. On average, my tattoos take about 4-10 hours to complete. Because I am Thai-American, my tattoos reflect my dual life. It is my way of paying homage to my culture, my parents, my life as a Buddhist. There is one tattoo, however, I love most. It was the simplest one. It took only two hours to complete. 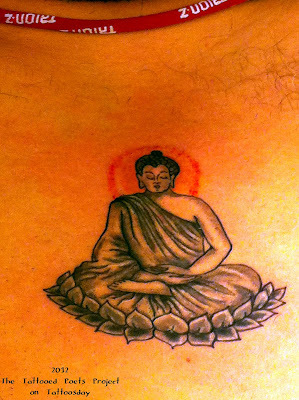 It is the image of Buddha on my chest. I used to wear a Buddha around my neck at all times. I was never without him. When I was nervous, I chewed on him. When I was scared, I’d grasp him tight in my hand. My mother gave me my Buddha. She said to keep him close to my heart. He would protect me. For most of my life, I had. Suddenly, I developed a skin allergy. I broke out in hives and rashes. I was allergic to Buddha! To fix this, to always have him with me, I decided to have Buddha tattooed on my chest. He is the first thing I see every morning and the last thing every night. There is a comfort in that. Seeing him there, in a jungle of chest hair, makes me feel lighter." around orbed-pupils, like an aerating wine. the sad song singing in her heart? I am learning to see. First, I close my eyes. Ira Sukrungruang is the author of the memoir Talk Thai: The Adventures of Buddhist Boy. His poems have been published in North American Review, Witness, River Styx, and many other journals. He teaches in the MFA program at University of South Florida and is the editor of Sweet: A Literary Confection. For more information about him, visit: www.sukrungruang.com. Thanks to Ira for sharing his tattoo and poetry with us here on Tattoosday!